Harry is a product of Movia Robotics, which moved to the city in 2017 after winning a business grant from the city. The firm approached the school district with an innovative plan to use robots to interact with students with autism, explained Michael Dietter, district director of special services. Dietter said the district got funding for the project through the Stocker Foundation, the Barnes Foundation, and the Main Street Community Foundation. The Movia team ran a pilot program for about eight weeks at Hubbell and Stafford elementary schools, twice a week, with Chris the robot (Harry’s twin) and a human facilitator teaching social pragmatic skills to a small group of children in different grade levels. The program ended right before the mid-winter break. “The students were learning primarily social skills - basic greetings like saying ‘hello,’ shaking hands, reciprocal conversation like ‘Hello, how are you?’ ‘I’m fine, how are you?’ those types of things,” he said. The facilitators who went into the schools with Chris were Rob Parenti, Movia’s vice president for business development, who has a background in special education and two young children in local schools; and Sherry Wong, who is completing certification as a Board Certified Behavior Analyst. Movia, located in the Walter Ingraham House on Federal Hill, was the $50,000 first place winner in the Bristol Development Authority and StartUP Bristol Task Force business plan competition held last July. The company got its start about eight years ago as a research entity in partnership with the University of Connecticut, funded with a $1.5 million grant from the National Institutes of Health. CTO Timothy Gifford was researching the pioneering concept of using robots in special education, working with schools in the Storrs area and in West Hartford. Within a few years it grew into a startup business located in Hartford, as entrepreneur Adam von Gootkin and others got involved. Von Gootkin had lived in Bristol so he felt it was a good community to move to. 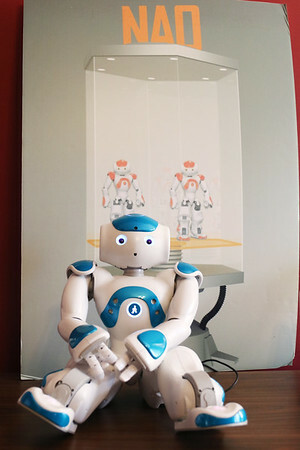 Movia uses robots from various Chinese manufacturers. 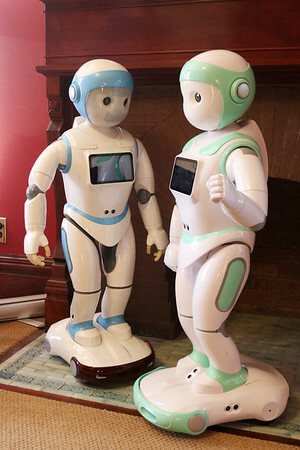 The robots are mostly similar looking to Harry, and range from about eight inches to three feet in height. 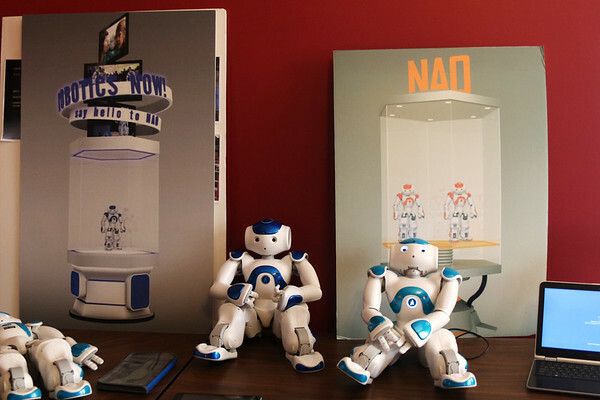 The company uses its own WOZ software, named for the Wizard of Oz, to control the robots. Children with autism have a hard time with social cues such as body language and voice inflections and tones, he explained. The robot can deliver a lesson in a patient, consistent, non-judgmental way, without triggering the anxiety these children often feel. Posted in New Britain Herald, Business, General News on Tuesday, 9 January 2018 22:35. Updated: Tuesday, 9 January 2018 22:37.